Chipotle is giving out a mobile offer good for a free order of chips and guacamole with any entree purchase when you play their new "'Cado Crusher" online game. 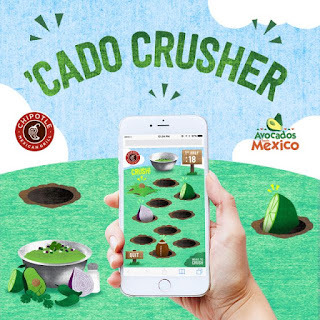 The game was created in partnership with Avocados From Mexico and is meant to highlight the short list of ingredients used to make Chipotle's guacamole. You can find the game on the Chipotle website here. After a quick play through, you'll get a mobile offer for the free chips and guacamole with entree purchase via text. The offer is available through February 7, 2017, while supplies last and expires February 28, 2017. It's limited to one offer per person, per mobile number.